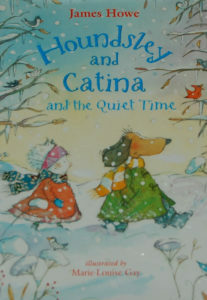 Houndsley and his friend, Catina, find themselves snowed-in for a day (with the first snow of winter). Catina worries at first - she has things to do before the concert that evening. Houndsley loves the quiet and isn't worried at all. Houndsley loves the way the world looks and feels while it is snowing. He calls it the "quiet time." When Catina continues to worry, they decide to practice for the concert (Houndsley plays cello, and Catina plays clarinet), just in case there is a concert that evening. Before they began to play, Houndsley said, "Listen, Catina. Can you hear it?" "The quiet. It is almost like music." Later, Houndsley suggests they pretend they are on an island - they can't go anywhere, but they have things on the island with them. They read poems to each other, then try writing their own. They bake cookies. They play board games. They build a fire and talk about things they see in the fire. They sit quietly thinking. They go outside to get more logs for the fire and end up playing in the snow - making snow creatures. They snowshoe to the gazebo with their instruments. The musicians seem to feel the quiet time too - and play softly to the audience. This is a sweet book for beginning readers. It is told in three chapters. There are color illustrations on every page. It captures the sense of magic and quiet that sometimes comes with a day of snow. These were favorite early readers of my oldest son. Thanks for sharing at The Children’s Bookshelf. My daughter liked these books when she was learning to read. I like The Quiet Time better than the first Houndsley and Catina book.